These last few weeks have been a whirlwind. I finally finished my resupply last Friday and brought it all over to Jackie's house and gave Nancy a run down on how everything is organized. I did feel that once I got all my boxes out of the house, I was able to breathe again. Then it came down to packing up the house. I thought I didn't own much, but when I was bringing them over to storage, it made me rethink my entire life and why I kept the things that I did. Half of me thought I should've just gotten rid of everything but then starting from square one can be really expensive. :/ Oh well. All is said and done. I must mention that for the past two weeks, I've been experiencing some sciatica pain which made me really anxious for awhile. 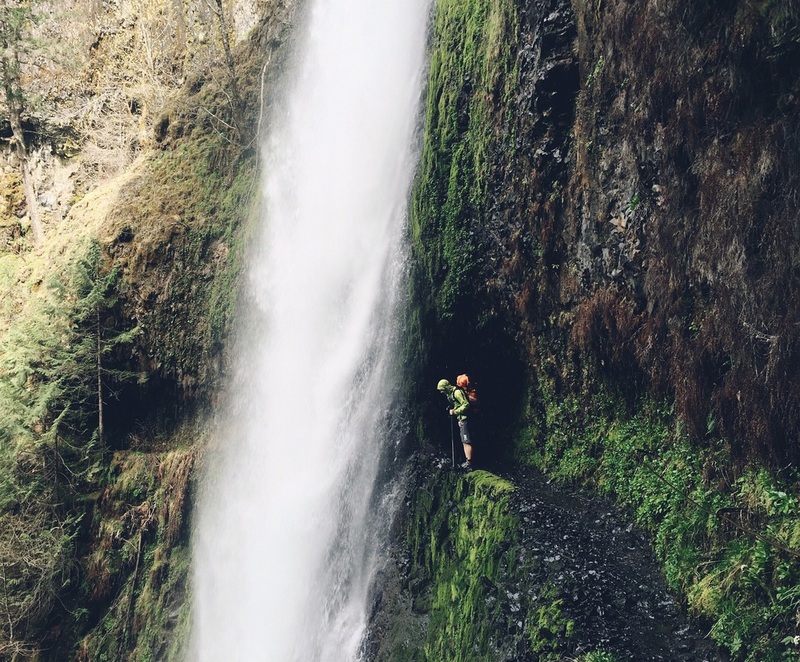 Two weekends ago, I went on a hike to Tunnel Falls in Oregon and I think that's where the pain began. We only went in 8 miles and 8 out and the trail was NOT strenuous at all. In fact, it was the most restful and relaxing trip that I had ever taken in a long time. But I did notice on the hike out, my lower back was hurting a bit but didn't think much of it. The following week, I woke up with some lower back pain on my right side and it went into my glutes and down my leg. The more I googled the symptoms, the more I was freaking myself out. I thought I had a herniated disc. Tunnel Falls, where my body was broken. The following weekend, I had a friend in town who is a PT and was able to give me an assessment. After talking with her, I was immediately relieved that I was not (that) broken. She gave me a bunch of stretches and exercises to do for the next few days. The pain comes and goes. I typically wake up feeling awesome and by mid day, if I'm moving extra hard, the pain becomes more intense. So I think what had happened was is (did that even make sense?) that my pack was sitting too high on my lower spine and compressing down on it causing a pinch to my nerve which has lead to my sciatica pain. The shooting pain down my leg is what got me worried. But I asked the PCT people if they've dealt with it on trail and a lot of them said they were able to manage the pain with daily stretches at every break along with the morning and evening routines. My PT friend advised me that I was probably okay to start the trail as long as I take breaks every 30-60 minutes and take off my pack. I just need to take it slow and easy. This is a good thing since I decided to shorten my mileage for the first few weeks and I am in no hurry. In amidst of all this happening last minute with all my health problems, I feel like God was trying to teach me how important it is to take care of my body, even though I had thought I initially was. I was definitely not putting it a priority and was letting it fall through the cracks. I don't believe it was a sign that he wanted me to not do this, because I do know that this is my calling, but he was trying to help me take care of my body on trail. I would've NEVER thought to stretch as much as I have been nor make flossing a daily routine, but I do it everyday now. I guess you just have to learn the hard way. After this week, I was able to see how the pain was with moving all my boxes. It's definitely still there but once it starts getting intense, I stop and stretch for a good bit and it helps alleviate some of that pain. I made the call to move forward with my initial plan to head out and am praying that it will heal on trail. If you know me, I am a person who always wants to be able to do everything on my own. For example, when I move, I try to do everything myself until the last bit where I need an extra hand because something is too heavy and I just cannot do it on my own. It's been a real humbling move this time around. Because my body is broken, I had to ask people several times for help because I couldn't risk injuring myself even more. I've been really overwhelmed with everyone's generosity and grace who have stepped in to help make this trip possible for me. People have come over to bring me boxes, help me pack, buy stuff I was selling, let me store things, borrow things, fix Ellie and even just come to say their final goodbyes. I keep thinking that I am burdening others just so I can go on this (painful) vacation for myself. But at the same time, I know they are happy to help and I need to accept that. I said my final goodbyes at my going away party on Saturday and got our nails done with some ladies last night. It was weird to say bye because it didn't feel real yet. I feel like some people won't even notice I'm gone. I'll be back before they know it. It'll be weird to not hang out with my friends this summer and do all the fun things together but I am excited to follow along with everyone back home. So many friends are starting families, getting married, launching start ups and moving. I feel like all our friends are currently in this mid-life stage where a lot of big changes are happening. I will miss everyone but am excited for them to also follow their callings. Today, I am dropping off Ellie and it will be my final goodbye to her. She's been having a lot of trouble in the past month and so I've had to drop a good chunk of $$$ on her but I think she is finally running well now and should be ok for the summer. I love her so much. She's taken me on so many adventures and helped me move every single time. I love her shape and how she can fit pretty much all of my belongings in like two trips. I'm glad to be keeping her and that I'll be able to come back to her. Once I turn in my house keys, I will be officially homeless. This is a strange feeling. I hope to update one last time in San Diego or maybe after I have officially reached the Southern Terminus. Until then, please keep me in your prayers! Thank you for all the encouragement and support already! !